Naryanganj historically developed as a colonial city and popularly known as the ‘Dundee of East’ since the mid-19th century, was famous for its world-class jute mills and textiles. Due of its position at the junction of river Shitalakshya and Dhaleshwari with a network of canals, it was one of the prominent and busiest river port in Bangladesh and has always been very popular among traders for various regional and international trades. As a hub for business, the ancient city has always been a one-stop city that embraces its history while retaining its inherited traditions and business since the Colonial era. Better roads, markets, well water and water drainage system and better work opportunities attracted traders, thousands of inhabitants and migrants from other districts particularly from neighboring southern and northern districts of Bangladesh for years. At present, it is one of the densest cities of the country with a population of 7 million and density of 9,444 people/ sq.km. 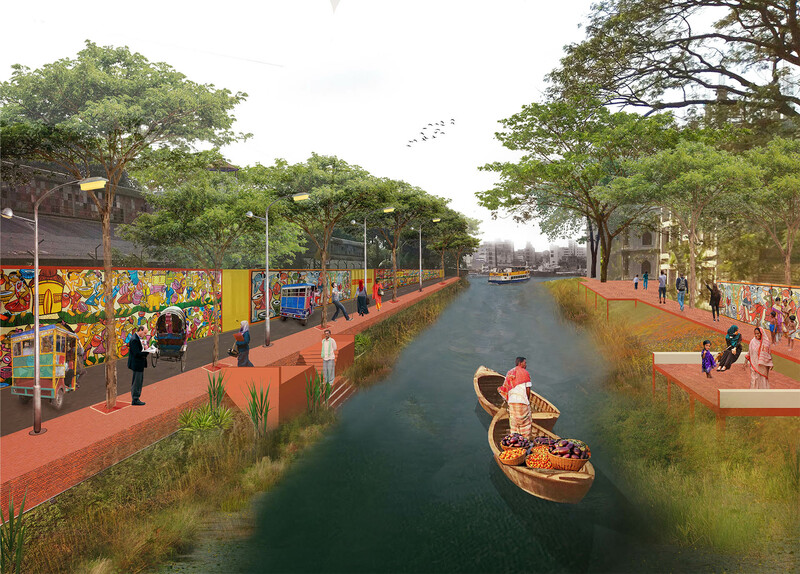 Many important canals and waterbodies have been encroached to accommodate the rising population and have lost their ecological, hydrological, communication and cultural values. Tribeni Khal is one such important canal that connects the city with diverse landscapes in the region which is gradually losing its existence. 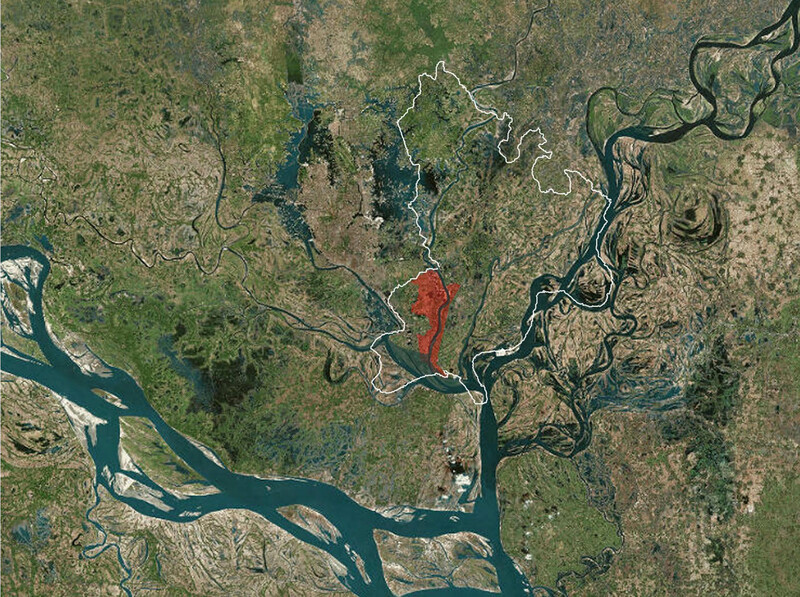 Bengal Institute is currently doing the hydrological analysis of Tribeni Canal and trying to find out a way to reactivate the canal and include new civic activities along the banks. Additionally, with time, inadequate housing, water pollution due to industrialization, lack of transportation and absence of a consolidated vision of the city are also being observed. The urban area of Narayanganj city is dotted with many industrial units mostly located on the two banks of the Sitalakhya River and the eastern bank of the Buriganga River. These industries create a lot of employment opportunities in the city. Many people come here for employment and business purposes from different parts of the country. At least 50% to 60% of the people currently living in Narayanganj City Corporation have come from the rural portion of the country. The population growth rate of Narayanganj is 4.48%. This rise in migrated population increases the demand of housing in Narayanaganj. Bengal Institute is working to assist understanding of the current land use especially for housing and future demand for housing by size, type, tenure and location in order to optimize the provision, management and use of stock. Moreover, Narayanganj has become one of the important centers of the wholesale trading of all types of commodities, especially, the textile products, yarn, dyes, chemicals, hosiery items, flour, edible oil, salt, cement, rod etc. With improvement of the communication system, especially road transportation system, volume of trade has substantially been reduced as newer wholesale marts around the country have emerged. Bengal Institute is now working for the development of transportation sector of Narayanganj with good connectivity with the whole country. Multi-modal hubs of multipurpose transport system can be planned and designed as the main port of Narayanganj. There is a chance to use road, rail or waterways together from the same place. Furthermore, a livable and sustainable city gives its dwellers the opportunity to move, travel, enjoy and involve in unique and relaxed activities. 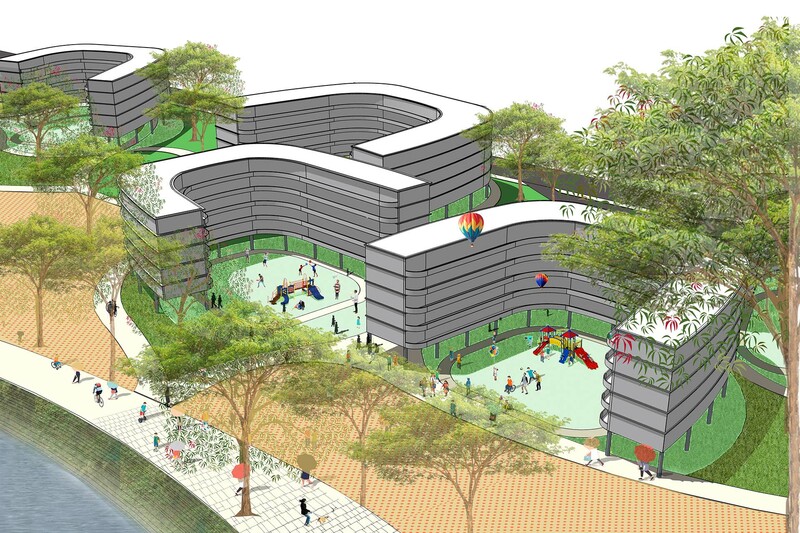 This experience can be delivered by providing the city dwellers with public gathering spaces for various activities. Again, pollution-free rivers, canals and other water bodies and their borders can give a unique experience in civil life. With the planned housing system, workplace, education and transport of people, there is a need for recreational activities for the dwellers. Again, these open spaces with proper management can also play important role in the local economy and tourism industry. 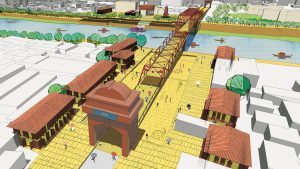 Narayanganj is now ready for renovation. 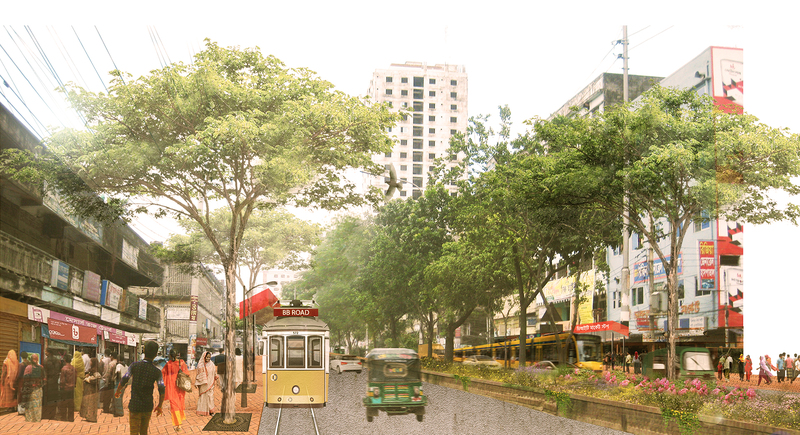 On the basis of proper planning, the city may become one of the most decorated cities in Bangladesh. 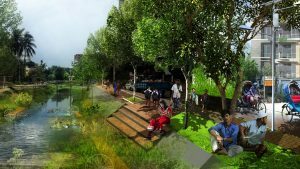 Narayanganj City Corporation’s Vision 2030 Commitment: “By providing the necessary services to the citizens, to create an environmentally clean, health-conscious, safe and poverty free planned city”. 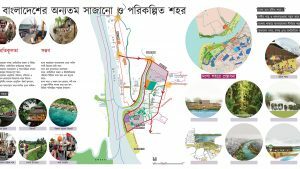 In view of this, the city corporation has adopted various periodic urban development plans considering the time limit for the next 20 years, which has initiated a new initiative by emphasizing the importance of public transport, public and housing at the moment and Bengal Institute is working to shape the vision into reality.